Please review this information prior to beginning your test. This policy outlines proctoring and testing security expectations for athletes when online neurocognitive testing is performed. Cheating on examinations is contrary to ethical standards as articulated in the AMA Code of Conduct Policy. Neurocognitive baseline tests are proctored.Tests are proctored using the Remote Proctor Now System. Athletes taking online neurocognitive tests through the Asterisk Mobile Medical Center are required to use this system. Online tests will not be available to athletes unless the Remote Proctor Now system is used. 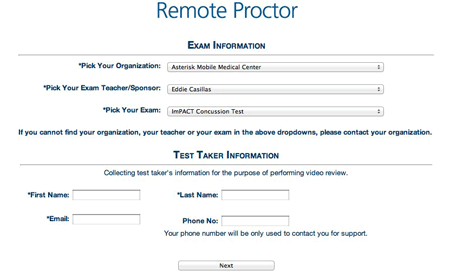 The Remote Proctor Now system will be used with online testing as instructed by Asterisk Mobile Medical Center staff. Athletes are required to establish identity following the procedures outlined in the Remote Proctor Now instructions. No other people in the room. No communicating with anyone; with the exception of contact with a Program Coordinator or support in an emergency. This includes the prohibition of cell phone use for any purpose. External cameras, when possible, should be placed on the lid of the laptop or where it will have a constant, uninterrupted view of the test taker. Web-cam must be focused on individual taking exam at all times. Nothing covering the lens of the camera at any time during the exam. Lighting must be “daylight” quality and overhead is preferred if at all possible. If overhead is not possible, the source should not be behind the student. Remote Proctor Now works with a web-camera and microphone either built-in or attached to the computer. In addition, testing requires the use of an external mouse. (Wired is preferred, but wireless can be used as well) These devices identify the student and capture video and audio throughout the exam and upload it to SSI’s secure servers. This video will be used for the purpose of establishing if any suspicious activity occurred during the test. REMINDER: IF YOU WANT A COPY, you must have a working printer or the ability to create a pdf. Results are automatically sent to the licensing organization. environment. All exam videos can/will be reviewed by the Program Coordinator. If cheating is confirmed, the athlete will be referred to the AMA Policy on General Offenses and Penalties. Athletes are encouraged to treat their personal exam location as if it was on a school campus. Note: For Remote Proctor Now Support – 855-436-2039. International support requests can use 1-617-658-2879. Agents within our call center will be available 24/7 to answer calls, but will only field basic questions—such as hitting the “Insert Exam Password” button, and navigating through the Authentication steps. All technical-based questions/issues will be escalated directly to L2 support and responded to from 7AM-7PM ET, Monday-Friday. Copyright © 2011 Software Secure Incorporated. All rights reserved. The baseline test itself is free; however there is a $30.00 charge for using “Remote Proctor NOW”, an online service that monitors students during an examination. You must have access to an appropriate testing environment, have an online connection, a web camera, and an external mouse. Baseline tests are a 30 minute proctored computer based exam. There are no pass/fail scores. It is used to compare with a post injury test. Step 1 – Testing Begins with an Equipment check. Make sure that your microphone is connected and your volume is on. 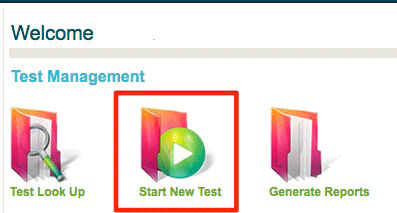 Step 2 – Choose Exam Information as follows and then complete the Test Taker Information. click “I’m in the exam now”. This message indicates that the 30 minute test timer has reached 00.00; You may continue the test after that point. Any other choice will leave you out of the software. Step 5 – At end of exam, print and/or save results and forward them to AMA with your competition application. When you are ready to begin, click on the image link below.